Poured Concrete 6" 1.33 Dead Air Space - 4"
The U-Value is commonly called for in commercial construction. U-Values are computed from "K" or "C" or "R" factors. To compute a calculated U-Value, simply add all the applicable "R" values of the construction assembly using the chart above and divide the total "R" into 1.0. Since a "K" factor is a measurement of heat transfer in 1" of homogeneous material and "C" does not include air film or construction components, the simplest addition is of "R" values. A wall cross section is composed of an exterior metal panel, 3" thick .6 lb. 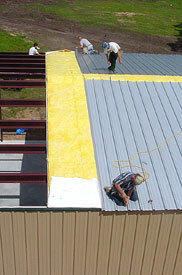 density fiberglass insulation, a dead air space, and an interior finish of 3/a" Gypsum board. Determine the total resistance. This represents the amount of heat transfer, in BTU's per hour, through one square foot of wall area for one degree Fahrenheit temperature difference. Assuming a greater variance than one degree Fahrenheit (ex. 70° inside, 30° outside), the amount of heat transfer is obtained by multiplying the calculated U-Value by the number of degrees temperature difference. In this case it would be .082 x 40, or 3.28 BTU's per hour per square foot. HEAT TRANSFER IS OBTAINED BY MULTIPLYING THE CALCULATED U-VALUE BY THE NUMBER OF DEGREES TEMPERATURE.